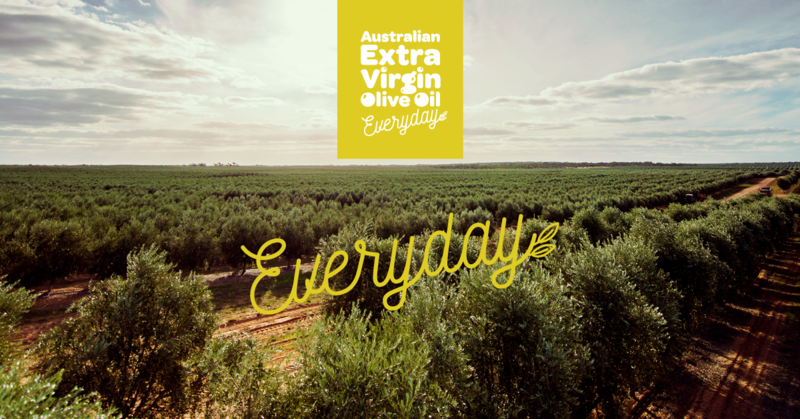 Tastebook is a sensory training initiative by Australian Olive Association (AOA) which continues its journey to share the experience of appreciating, describing and understanding the quality of extra virgin olive oil (EVOO) and table olives (TO). After two successful previous rounds, the current training program focussed on positively describing taste, flavour and aroma attributes of EVOO and TO and emphasizing on how to write well-crafted descriptors fitting the products. It is important to know how to describe well the sensory experience of either an EVOO or TO, and communicate the message to the general consumers. For this reason, this particular round of Tastebook program is more on providing a platform to the participants from different levels of judging expertise to have a positive experience in descriptor writing. The Tastebook- Round 3 was successfully introduced in 2nd week of March 2018 and concluded on 30th April 2018. 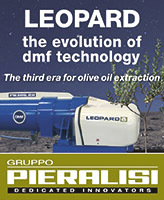 A total of five samples were sent to participants within Australia and abroad (Argentina, New Zealand and USA); three of them are EVOO and rest are TO, respectively (Table 1). All five samples won Gold Medals at the Inaugural 2017 Australian International Olive Awards (AIOA). A total of 78 participants from national and international arena took part in the current round of the Tastebook program. The “judging experience” of EVOO and the Table olives of the participants are presented in Figure 1A and 1B- which reflects a large number of participants are still the olive oil enthusiasts or the producers who would like to understand how to describe well both EVOO and TO. 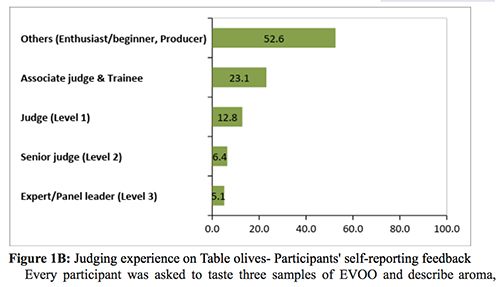 The level of participation from the judges from different levels for EVOO is encouraging (Figure 1A). However, more participation is required for Table Olives judges from Level 1-3 in future rounds of Tastebook (Figure 1B). flavour and mouthfeel attributes with minimum 3-4 descriptors. 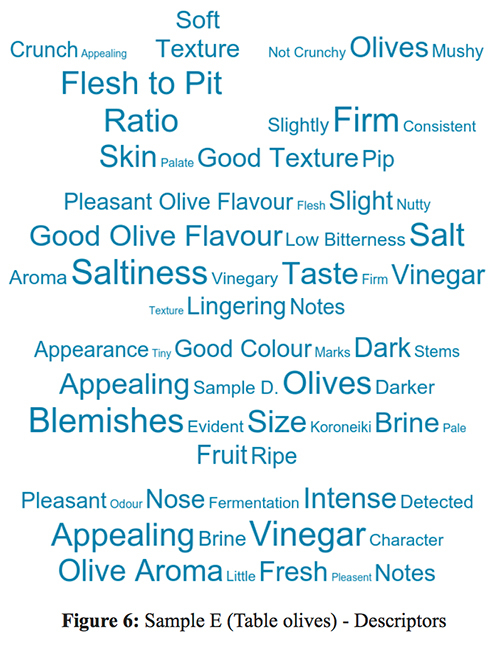 As the learning intention of this round of Tastebook is to provide a platform for the participants to experience describing EVOO, the diversity of answers and descriptors relate to the level of judging experience of the participants. To visualise better how each sample was perceived and described by the participants (irrespective of their own experience), a “word cloud” was developed to summarise the feedback (Figures 2, 3, 4). To read the word clouds easily, one has to identify the “size” of the words mentioned inside the cloud- the bigger the size of the descriptor, the more frequent that particular descriptor is repeated within participants’ feedback for each sample. 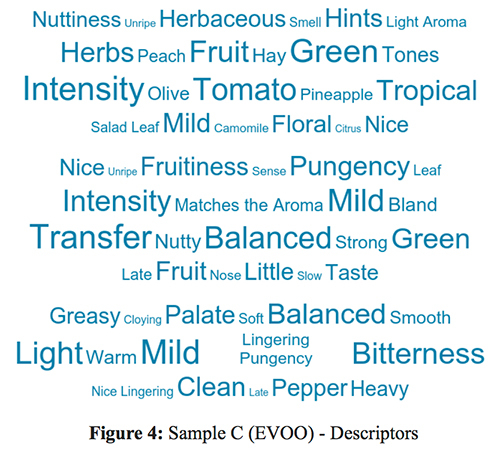 To make it reading easier, all three attributes of aroma, flavour and mouthfeel for each sample were combined together and represented as one word cloud. Thus, Figure 2 represents Sample A, this sample of EVOO can be described as having “green tomato, apple herbaceous and grassy/rocket aroma, clean mouthfeel with complex, lingering palate, good flavour transfer, mild peppery, green intensity and long finish, with medium/mild pungency and bitterness”. 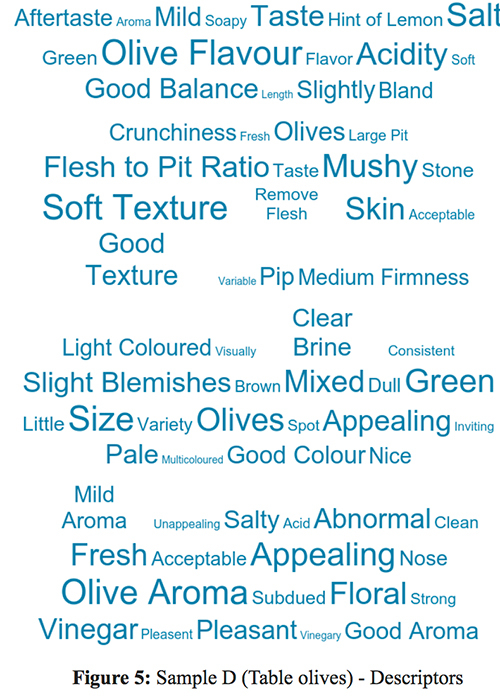 Every word cloud is different and thus it can stand alone describing the particular EVOO sample holistically. 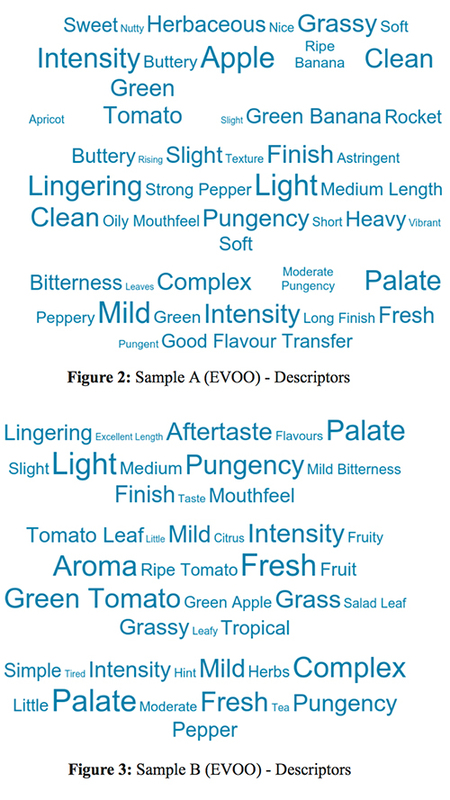 It is evident from all three word clouds (Figures 2-4) that the participants could perceive the differences in sensory attributes for all three EVOO samples and they could comfortably describe them well. The numbers of descriptors written by the participants irrespective of their judging experience show an agreement among them for individual oil and this agreement can be considered as an achievement for this program. Similar approach was taken into consideration for writing descriptors for the two Table olive samples. Figures 5 and 6 describe the word clouds reflecting participants’ perception about the most suitable descriptors for both samples. Sample D was perceived as good sized Table olives of light colour with slight blemishes, clear and consistent brine, fresh appealing clean olive aroma with pleasant floral and vinegar note, good balance in olive flavour and texture, reasonably firm texture within fingers but softer in mouth, good balance in acidity and saltiness, mild taste, green olive flavour and slight pleasant aftertaste (Figure 5). Sample E was described as having even good colour and appearance and more appealing compared to sample D, the olives were darker in colour and blemishes can be seen on the surface. The brine is pale and the most olives were ripe. Sample E was identified as Koroneiki olives by most of the participants. The TO sample had a pleasant odour with fresh olive aroma, notes of fermentation was detected, brine was appealing and vinegar notes was perceived. The flesh to pit ratio was considered good for both table olive samples. Sample E was perceived as having a good/pleasant lingering olive flavour, slightly firm texture in mouth, not crunchy enough, low bitterness and saltiness, balanced taste profile with vinegary aroma (Figure 6). The round 3 of Tastebook program has received many positive feedbacks from the participants about the judging criteria, the training notes provided with the samples and the ease of using the SurveyMonkey format. There are a couple of learnings from this round- the most important one is about descriptor writing. 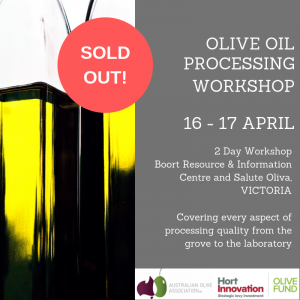 Most of the participants believe that the training notes were helpful, but they would also love to have more information or “story” of each oil/table olive to understand and judge it better. The process of writing descriptors was not easy for many trainee and enthusiasts; however they took it up with a positive intention of learning how to write descriptor well. The use of online SurveyMonkey system to capture participants’ feedback gathered positive responses; however some participants had difficulties in completing the evaluation online in one sitting. One of the recommendations from many participants is to have a “training session” or “seminar” where the willing participants can learn more about not only how to describe EVOO and TO, but how to appreciate them and upgrade their skills. 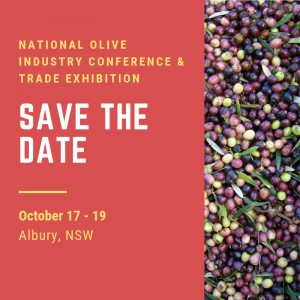 The National Olive Oil Conference in Wagga Wagga this year is taking this feedback seriously and thinking about holding a training session especially catered to the Tastebook program. More details will be available in coming months. In summary, the Round 3 of the Tastebook online electronic version provided a great benefit and platform to most of the participants to assess EVOO and TO samples and learns how to describe them well. 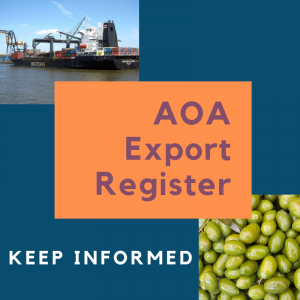 Most participants are willing to take part in the future rounds of Tastebook program and they see clear benefits to them and the Australian Olive industry in continuing this quarterly program. The next round of Tastebook Round 4 is scheduled for August 2018 and will be focussing on Green oils and green olives. The author would like to sincerely acknowledge and thank Shane Cummins, AOA Chief Judge and the Tastebook Convenor, Peter McFarlane, Convenor- National Table Olive Committee (AOA) and Gerri Nelligan, Managing Editor, Australian & New Zealand Olivegrower & Processor for their continuous support, patience and strong belief in making this unique Tastebook initiative successful.